IdaTech is a publicly traded fuel cell firm that's shipping product and making headway in the challenging remote power market. The firm's fuel cell technology is made of PEM (polymer electrolyte membrane -- also called proton exchange membrane) variety, and the main market focus is on telecom cell tower back-up. Cell tower back-up might seem mundane but it is an enormous and growing market. The market is targeted by other energy storage firms like Deeya Energy. IdaTech is publicly traded and floated on London's AIM in 2007. The firm shipped 445 systems in 2009 and doubled its 2008 revenue from product sales to $4.5 million, while managing to post an operating loss of $33.5 million in the time-honored, money-oxidizing tradition of fuel cell companies. I spoke with IdaTech's CEO, Hal Koyama. PEM fuel cells can use hydrogen gas as a fuel or a methanol/water mix used in tandem with a reformer, which strips the hydrogen from the fuel. Using the reformer eliminates the need for transporting and dealing with hydrogen gas and what CEO Koyama referred to as the "hydrogen barrier." The telcos like fuel cells, according to Koyama, but the previously mentioned hydrogen barrier is a challenge -- one that's solved by using the reformer. The products from IdaTech have output ranges of 250 watts to 5 kilowatts. 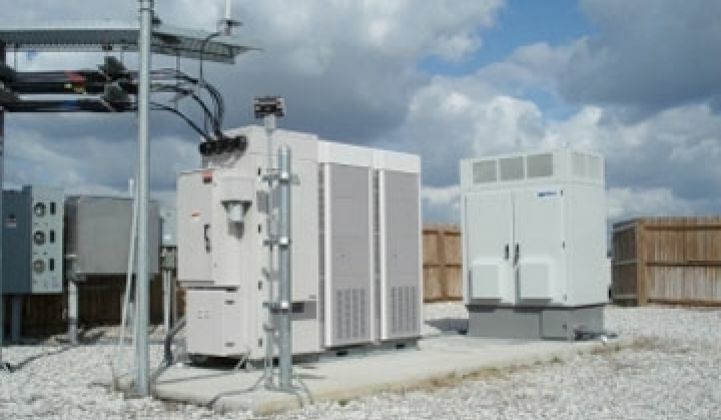 If you are the sales director for this company, you should anticipate a lot of frequent flyer miles and the use of mosquito repellant, because the $2 billion DC telecom backup market that's suited for fuel cells is likely to be strongest in Asia Pacific, the Middle East and Africa, where back-up to grid is needed most. The telecom application is the "lowest-hanging fruit" and the distant markets are most in need of back-up because of their remote nature, harsh environments and weak electrical grids. The developing world is building tens of thousands, perhaps hundreds of thousands, of new towers that will require back-up, according to the CEO. In the developing world, cell phone plans are still by the minute, so every minute of downtime means millions of dollars lost for the larger carriers. 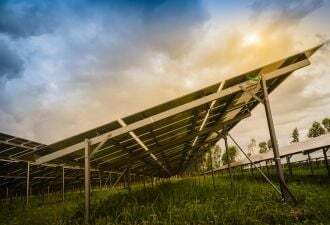 This technology is deployed at the end of the line in the worst environments, where the main competitors are diesel gen sets and lead acid batteries. Koyma claims that IdaTech's PEM fuel cells have a lower life cycle cost than a diesel generator. Mass adoption will occur, according to the CEO, when the fuel cell is priced at or below the cost of a diesel gen set. The target price for a fuel cell system with a reformer is about $3,000 per kilowatt. Based on a quick look at my favorite survivalist website, Survival Unlimited, diesel gen sets are cheap and fuel cells have a ways to go to catch up in terms of price. In Koyama's view, the fuel cell industry was "seeding the market in 2006 and 2007" and has "just about hit critical mass" He sees his products soon being deployed in five of the largest telco networks worldwide. The recent loud noise in the fuel cell world has been Bloom Energy and the Kleiner-fueled hype fest for SOFC, or solid oxide fuel cells. Asked about that 500-pound fuel-cell gorilla, the CEO said that Bloom is targeting a slightly different market -- stationary continuous power -- and is essentially competing against the grid. Competing against the grid is a difficult value proposition according to Koyama: "It's reliable and huge and cheap." Since the Bloom boxes are fueled by natural gas, Koyama asks, "Who manages the risk hedging the natural gas cost? If natural gas cost goes up, the value proposition goes away. The value proposition is rather fragile." We've seen at least one VC investment in fuel cells in 2010: ClearEdge Power builds a fuel cell that converts natural gas into heat and electricity. The startup raised $26 million according to SEC filings -- $15 million last year and $11 million more added this year. 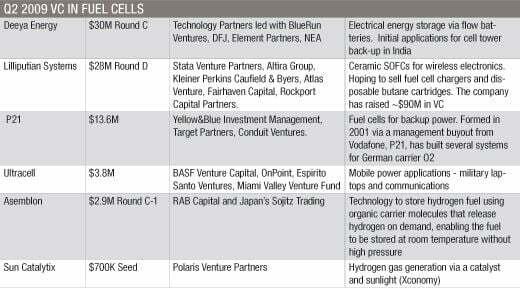 Investors include Applied Ventures, Big Basin Ventures and Kohlberg Ventures. Another fuel cell vendor, Ceres Power in England, will soon release a household fuel cell for use by utilities in the U.K. and Ireland that can, in part, be built from diesel engine components, according to Imperial College London professor and co-founder Nigel Brandon. Panasonic already sells one-kilowatt fuel cells to homes in the Osaka region. Neah Power goes after portable power applications with their fuel cells.